By Kori ~ April 7th, 2008. After attending the Unique Wines from Around the World program last month, Dad (John) and I became inspired to see just how many different grape varieties we have had through the years. We had heard about the Wine Century Club (if youâ€™ve tasted at least 100 different grape varieties, you are qualified for membership) but had not really given it much thought until that evening. So when we returned home, we went on the Wine Century Club website and printed out a membership application which lists numerous different grape varieties. We began looking back through our tasting notes and marking off the ones that we had already had. At that point, both of our tallies were in the 70â€™s. Thirty more to go seemed very doable. When we set our minds to something, we go for it and usually donâ€™t waste much time (Iâ€™m sure this is not news to those who know us personally). And so it was with the Wine Century Club. We went online to K&L Wine Merchants and ordered a case of wine, each bottle containing at least one grape variety that we had not previously tasted. Then one evening all four of us Wine Peeps gathered for a Wine Century Club tasting. 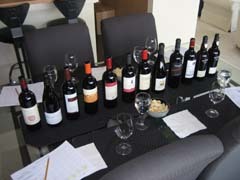 We put all 12 bottles out on the table and tasted them one-by-one, discussing them as we went, stopping to read the labels to learn more about some of them. What a fun tasting! Not only did we try some new varieties and mark off some more boxes on our Wine Century list, but we found some wines weâ€™d definitely like to have again and discovered some excellent values as well. Since many of these wines are relatively unknown, you are not paying for a â€œlabel.â€ If you are tired of drinking your stand-by Cabernet Sauvignon or Merlot all the time, I encourage you to give one of these a shot (especially one of the top four listed below which are all 5 bangs-for-your buck). Hereâ€™s a rundown of the wines that we tasted (regions listed in parentheses). 2005 Pasetti Montepulciano d’Abruzzo (Abruzzo, Italy): Grape: Montepulciano. Deep purple with pleasant aromas of blackberry and spice. Exhibits flavors of ripe, black fruits. Very well-balanced and elegant. Lively acidity, bold tannins, and a long, lingering finish. 2006 Donnafugata Sedara Nero dâ€™Avola (Sicily, Italy): Grape: Nero dâ€™Avola. A bit earthy with hints of buttered popcorn on the nose. Plums, pepper, and spice come through on the palate. Medium-bodied with smooth tannins, and a medium-plus finish. 2005 Madiran Domaine Berthoumieu “Charles de Batz” (Southwest France, France): Grapes: 90% Tannat, 10% Cabernet Sauvignon. Very dark and dense. Aromas of fresh cut grass leads to flavors of spice and black fruits (especially blackberries and blackcurrants). Big, bold puckery tannins with an extremely long finish. Should be even better in a few years as the tannins soften a bit. Blandy’s 5 year old Bual Madeira (Madeira, Portugal): Grape: Bual. Dark brown in color. Exhibits some maple syrup and alcohol on the nose. Well-balanced with flavors of caramel, toffee, and burnt wood. Good with dessert or as a dessert all on its own. 2005 Vigne e Vini Schiaccianoci Negroamaro del Salento IGT (Puglia, Italy): Grapes: 85% Negroamaro, 15% Malvasia Nera. 2005 De Conciliis Aglianico Donnaluna (Campania, Italy): Grape: Aglianico. 2005 Scacciadiavoli Rosso di Montefalco (Umbria, Italy): Grapes: 60% Sangiovese, 15% Sagrantino, 15% Merlot, and other red grapes. 2003 Foradori Teroldego Rotaliano (Trentino-Alto Adige, Italy): Grape: Teroldego. Blandy’s 5 year old Sercial Madeira (Madeira, Portugal): Grape: Sercial. 2006 Valle dellâ€™Acate â€œIl Frappatoâ€ (Sicily, Italy): Grape: Frappato. 2005 Iby Zweigelt Classic (Burgenland, Austria): Grape: Zweigelt. 2006 Clos Roche Blanche Touraine Pineau d’Aunis l’Arpente (Loire Valley, France): Grape: Pineau dâ€™Aunis. It’s under their “Deep Creek” label. Thanks for the great blog!